If you’re going to visit Bryce and are wondering what’s the best Bryce Canyon lodging? Then I would quickly ask, what kind of stay are you after? Are you looking for a rugged adventure? A hotel room experience, a Bed and Breakfast, or a Bryce Canyon log cabin experience? Or are you more after finding the perfect place to camp for the evening? There are so many options when it comes to Bryce Canyon. And why stay in Bryce? Because of images like these; because this is what you’ll get when you visit Bryce. 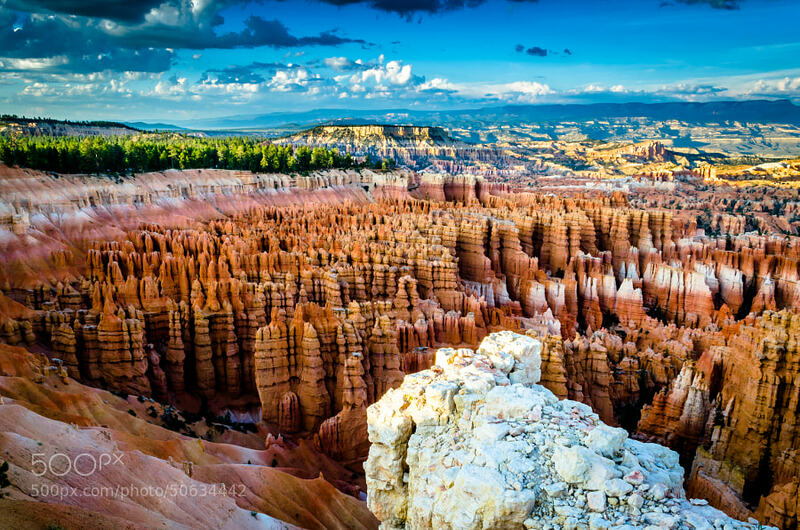 Have you ever wondered why Bryce Canyon’s called an amphitheater? This incredible image shows you exactly why. There are multiple RV spots available in the park itself. The two campgrounds found within Bryce each have spots for RV’s, but make certain you come early because they can fill up at times. As I said before there are two campgrounds available which are not only for RV’s but tent camping as well. These offer the most intimate Bryce Canyon experience as you’ll wake up among the giant ponderosa pines that are so iconic of Bryce Canyon. There are quite of few hotels available near Bryce if you’re after a less rugged adventure when visiting the park. All of them are geared towards providing you a wonderful stay as you’re seeing the wonders of Bryce Canyon. And if you’re after a more simple and quite stay, then there are a handful of Bed and Breakfasts available for you as well, either for that romantic getaway or just a little break from the day to day. We have compiled a list and links to our favorite Bryce Canyon lodging hotels, Bed and Breakfast’s, and RV spots here. We hear often of people who stop in Bryce Canyon and had only planned on spending a few hours here before continuing on their journey; these people often speak of their regret from failing to realize that Bryce Canyon offers so much to see and do. They realized too late that they should have found lodging in Bryce Canyon before-hand so that they could have seen more and experienced a greater portion of what Bryce can offer. If you come to Bryce and only plan on spending a few hours, you’ll be both happy and sad at the same time. You’ll be happy you were able to at least see the wonderful amphitheater that is Bryce, but likewise you’ll be sad to have to leave so quickly. You’ll be leaving so much behind as you continue on. So don’t make that mistake, get lodging at Bryce Canyon so that you see all that is this wonderful national park.